Sometimes — usually for a position in the Eastern Cape High Court — there appear candidates who are so extraordinarily deleterious in their effect on the wellbeing and image of the judiciary that one is left wondering if they are plants: there merely for the sadistic, comedic pleasure of the Judicial Service Commission’s (JSC) sifting committee. A more serious question is how candidates like magistrate Nolutando Conjwa get shortlisted? During her 2012 interview before the JSC it emerged that Conjwa had taken 14 months to deliver a judgment. In the five years between interviews she had managed to spend two of them not writing and handing down another judgment. According to the norms and standards for judges, they have three months to deliver a judgment, or can do so later in the following term, but only with the permission of their judge president. Conjwa was also “almost certain” that another judgment been handed down, but couldn’t be sure because her “laptop had crashed” while her memory stick storing a copy “had a virus” and the case file couldn’t be found at the court registrar’s office. “What did it then prompt you to do?” asked the chief justice. Dololo, it would appear. Conjwa admitted her inaction had been a “mistake” and said she had a habit of starting to write a judgment before stopping “halfway” to start another, or to move on to focusing on hearing criminal cases in the magistrates court. It later emerged that she had also accumulated around 200 days of leave. National Council of Provinces Chairperson, Thandi Modise, then bluntly told Conjwa that such dereliction betrayed the anti-apartheid struggle for a non-racial, non-sexist society and sincere attempts at transforming the judiciary and broader society. “I don’t think you are doing what you think is a service to your country,” said Modise. Modise intimated that as a public representative she would be failing in her moral obligation to work towards a better society if she supported Conjwa’s candidacy. 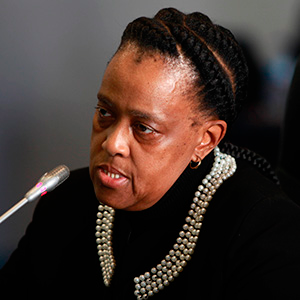 “Why must South Africans be subjected to a judge that has no compunction in telling us it has taken her fourteen months and then two years, to write a judgment?” asked Modise. The interview lasted about fifty minutes, which was probably a half-hour too long. Sometimes, the commissioners can be like sharks detecting blood in the ocean and several of them had an opportunity to snap in with a bite of indignation or righteousness. Conjwa did not get the job.